Do you ever get to the point in a project where you are *so* close to finishing that you sort of let your mind think you already have, and it hops right over and latches onto a new project idea or three? Yeah, me too. I have at least three projects that are in their final stages yet have been put aside for the past month, while I instead started a handful of new projects. Who doesn’t love a new project?! Yesterday I decided it was time to get those nearly finished projects into the finished pile, and I pulled my favorite one to the top to start. Remember this? 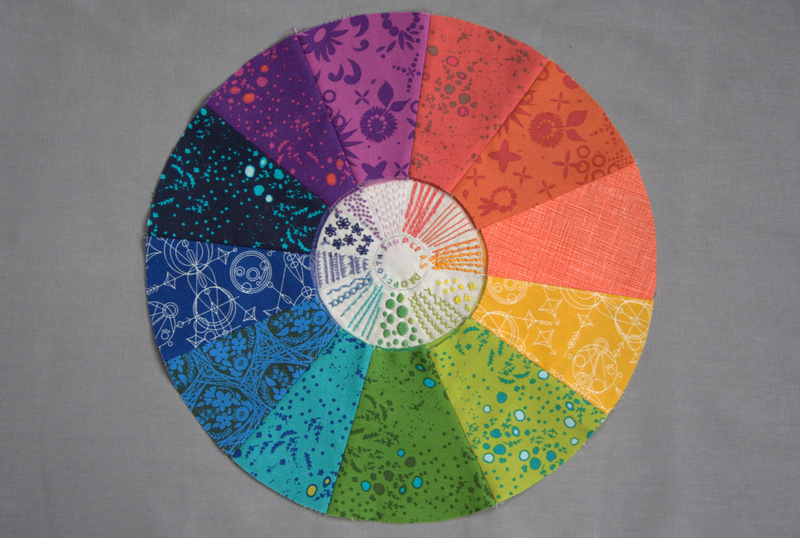 Over a month ago, I finished my first ever embroidery sampler, this Color Wheel by Rebecca Ringquist of Dropcloth. I used Aurifil 12wt thread for the first time, learning the stitches as I went, and loved it SO much when it was finished that I just couldn’t let it be actually finished. So I hatched the plan to extend the color wheel using none other than my favorite saturated rainbow: Alison Glass’s 2015 Sun Prints. Putting it aside was not out of lack of love or excitement, don’t get me wrong. I LOVE this project and it feels so good to pick it up again. I just get into spots where the ideas burst and I have to get them started so that they are real. 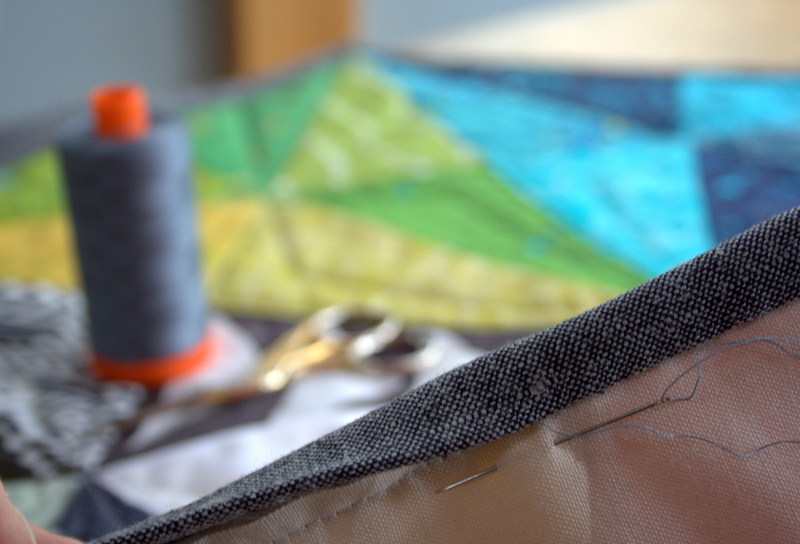 You know what I mean… a project with fabric cut and design sketched and a few stitches invested is a real project. It’s a lot less likely it will sit stagnant in the pool of unrealized ideas once it’s been at least partially begun. So back to my color wheel. I managed to match the fabrics almost exactly to the colors of the Aurifil embroidery, which is incredible. It seems like Alison Glass and Rebecca Ringquist and Alex from Aurifil must have all gotten together to design this harmonious flow with the perfect combination of design, color, thread, and fabric, it goes together that well. I wanted to be sure that the prongs of the outer color wheel aligned with the organically drawn prongs of the embroidery wheel, so I scanned my embroidery sampler and uploaded it to Inkscape, the free vector program with which I design patterns. I created larger circles, centering the embroidery, and extended the lines on the sampler to create wedges. I then printed it, cut out the wedges with scissors, and used them as templates to cut the fabric wedges, as shown in the Instagram photo above. I winged it, really, but amazingly it came together beautifully. 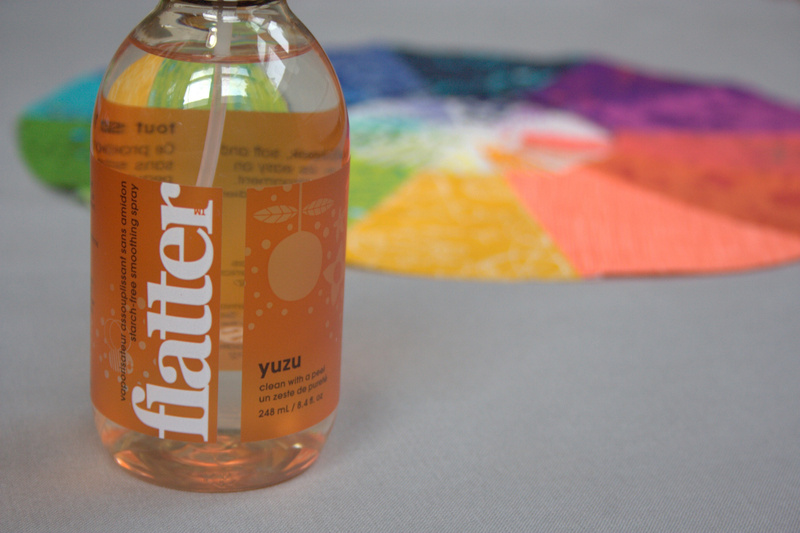 I also used Flatter by Soak spray for the first time since QuiltCon, and I’m amazed I survived without it. 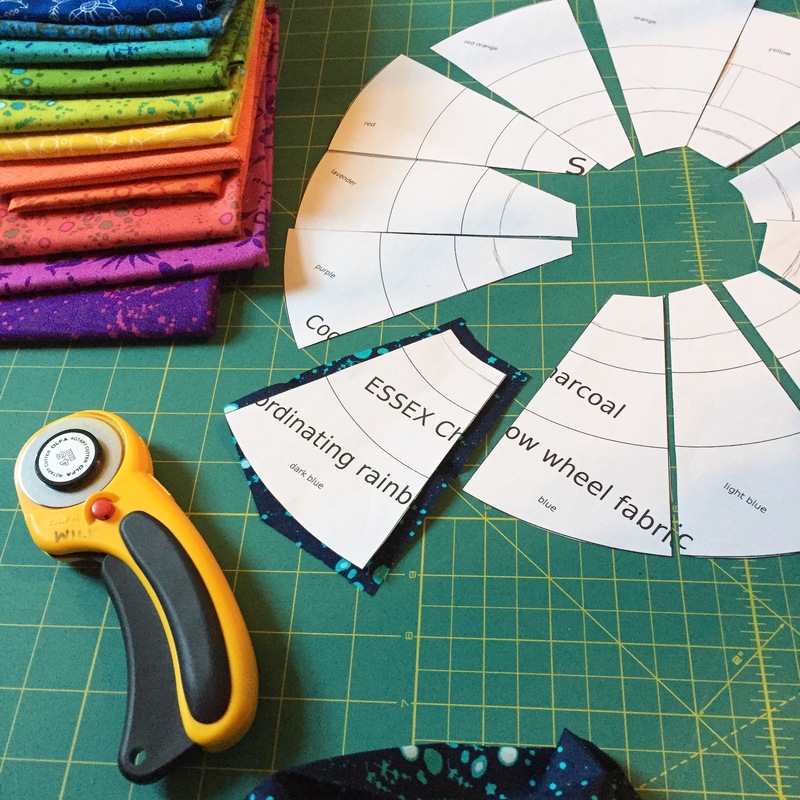 Between the new machine sewing like a dream and the seam-relaxing Flatter spray, this circle came together without a hitch. Now I am going to study up on circles by watching Cheryl Arkison’s class Inset and Applique Circles by Machine on Craftsy (affiliate link). It’s my first time trying a class on Craftsy, but I hear there are subtitles. I also was fortunate enough to take a class with Cheryl Arkison at QuiltCon, so I have no doubt of her depth of knowledge and skill. I’m really looking forward to trying to attach these circles! 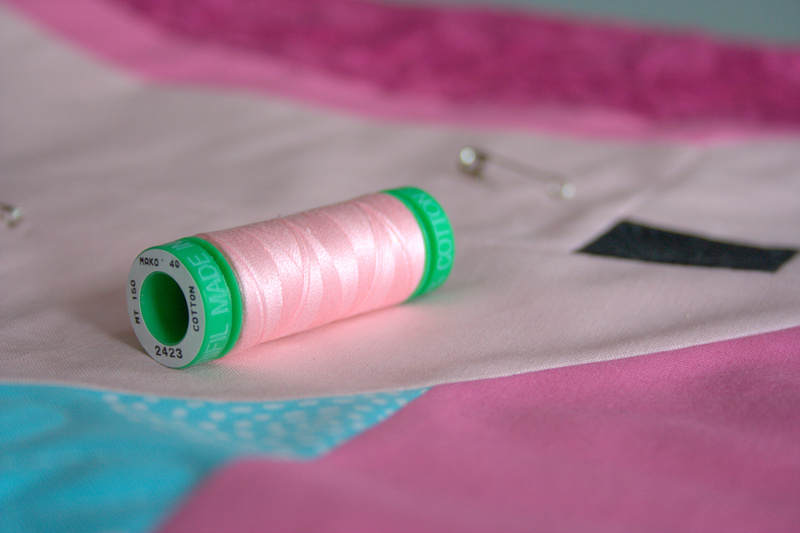 Having never sewn a circle by machine, and perhaps only one by hand, this will be a creation filled with firsts. I’m getting awfully close to completing this beauty, though, and I’m loving every step of the way. 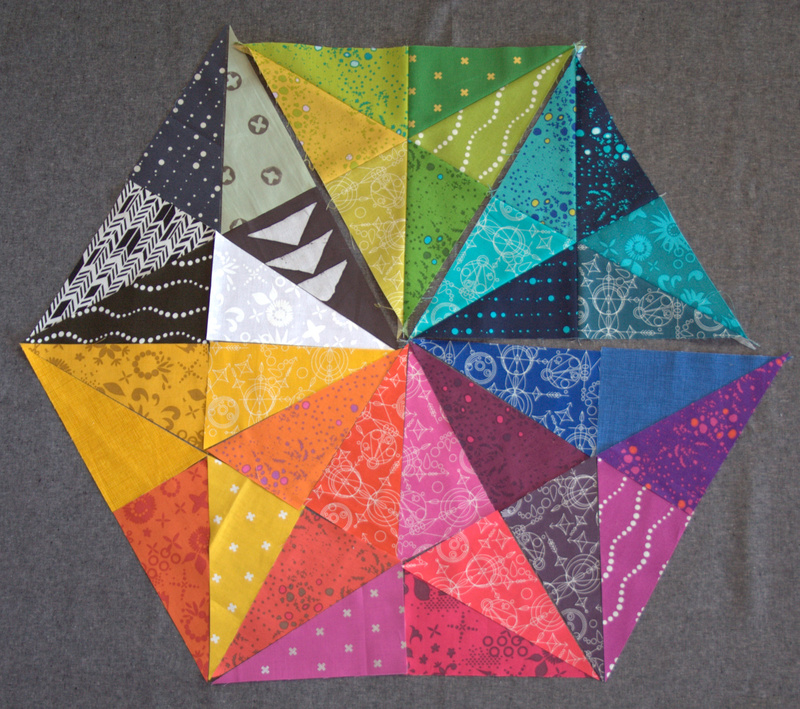 I’m linking up with Lee at Freshly Pieced for Work in Progress Wednesday. Fat eighths bundle pulled from my stash favorites. Giveaway on Instagram only. 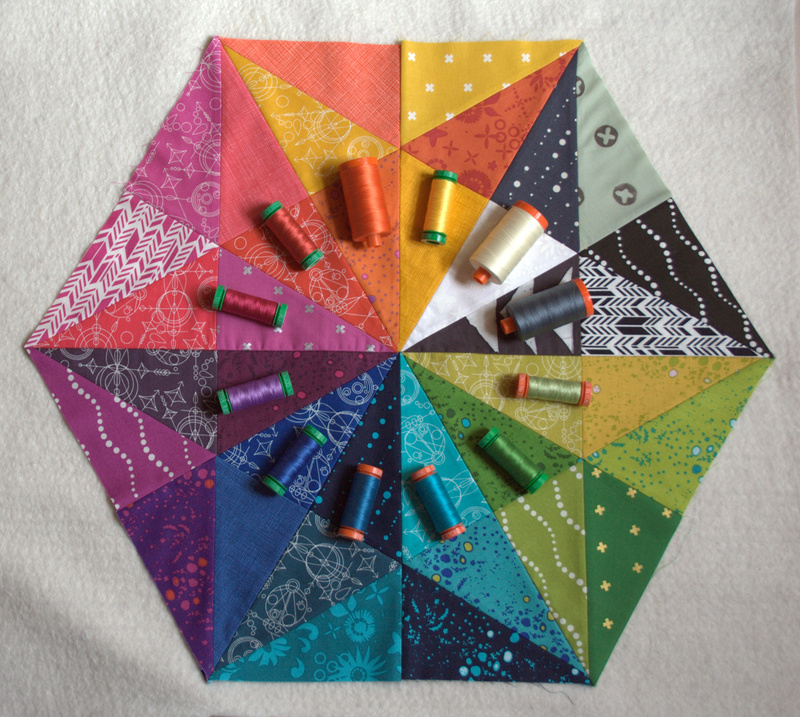 Aurifil thread set and Flatter by Soak, graciously provided by Aurifil and Soak. Giveaway is on Instagram only. You’re probably familiar with the pinkalicious quilt I made for my sister in law a few months back. 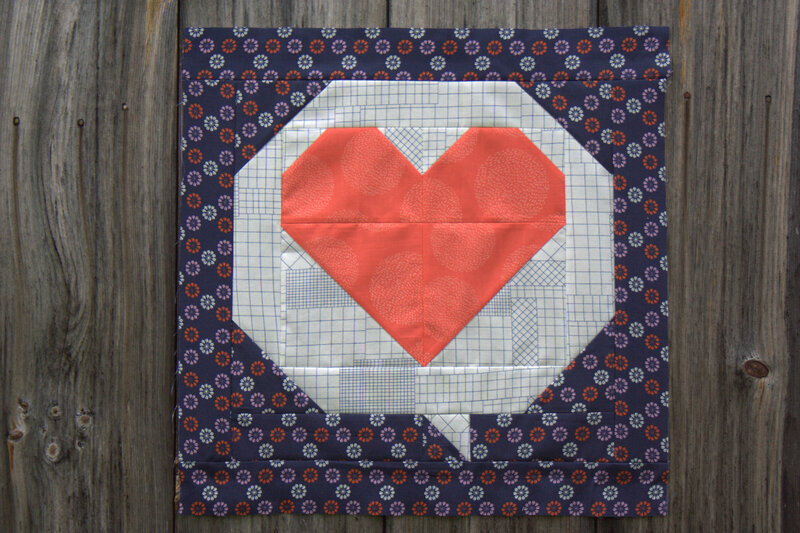 The heart in a speech bubble I designed for that quilt was begging to be made into a mini of its own, and I’m excited to announce that it’s ready for release! I named this pattern Hello, Love! , which I, well… love! 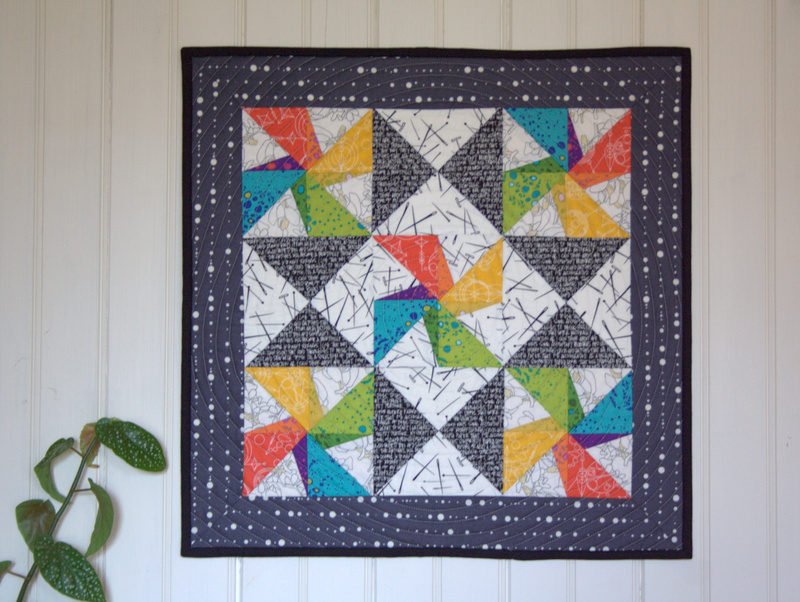 The mini quilt finishes at 20″x20″ and would also be perfect for a pillow or as part of a larger quilt. 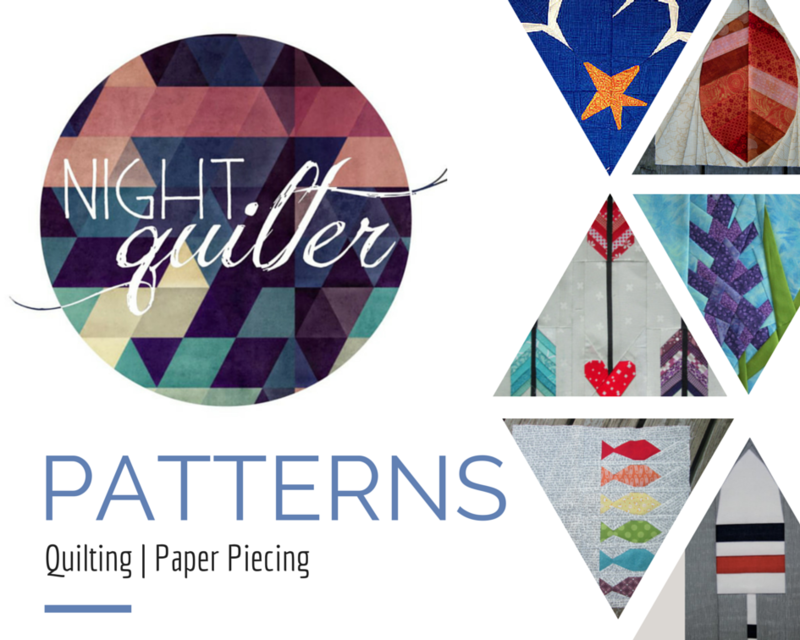 The pattern is my first publicly available traditionally pieced pattern (that’s right–it’s not paper pieced! *gasp*) and is fat quarter friendly. There are clear instructions for cutting and piecing, including diagrams and tips. 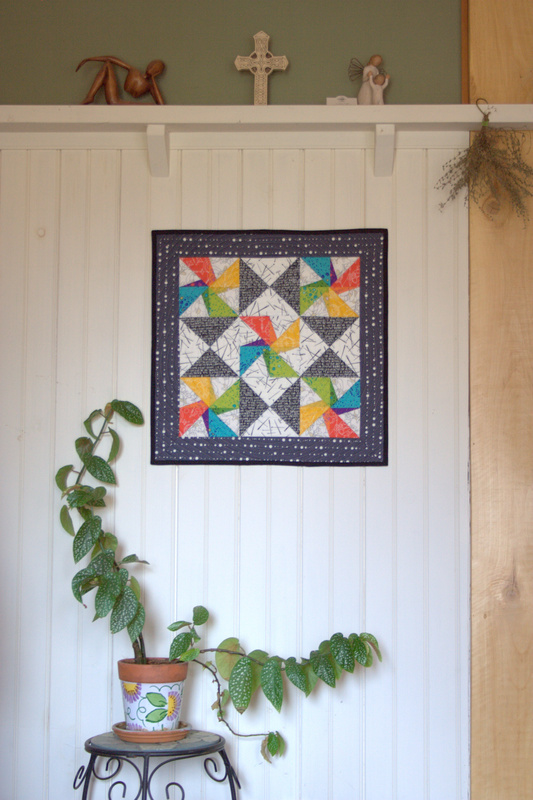 The pattern also includes diagrams showing how to make two half square triangles (HST) at a time. This pattern is a great way to showcase your favorite fabrics, or show your love for anyone or anything. The heart is a great place to applique anything under the sun, be it the name of your bestie, your kiddos, your fur babies, or a picture of a unicorn, camera, or kale (don’t we all love kale?). Note that applique details are not included in the pattern. Hello, Love! is available in my Craftsy store (and Payhip for those of you in the EU) and will be on sale for only $5 for the first week, after which it return to its normal price of $8. Just a peek at some of the testers’ Hello Love minis! Makers left to right: Christopher @the_tattooed_quilter, Lisa @duhquilts, and Michelle @frustratedquilter. Many thanks to my testers, who provided helpful feedback and spotted my late night typos. You may have seen a few of these minis around the Instagram world already, and can see more by checking out the tag #hellolovequilt. When you make your version, please tag #hellolovequilt and @nightquilter so that I can see! 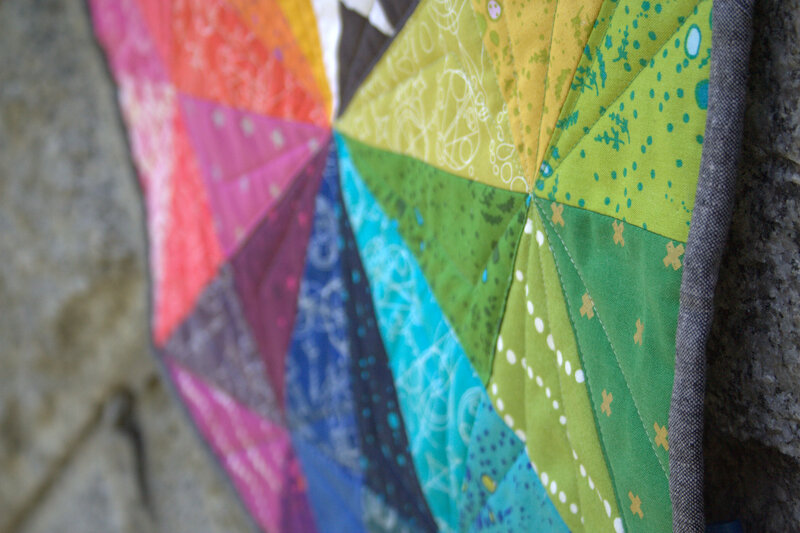 I’m linking up my flimsy and pattern finish with Crazy Mom Quilts Finish it up Friday. I bought a new sewing machine, so I’m waiting until it arrives before I quilt this mini, but I just couldn’t wait to share the pattern! Enjoy, and I can’t wait to see what you create. 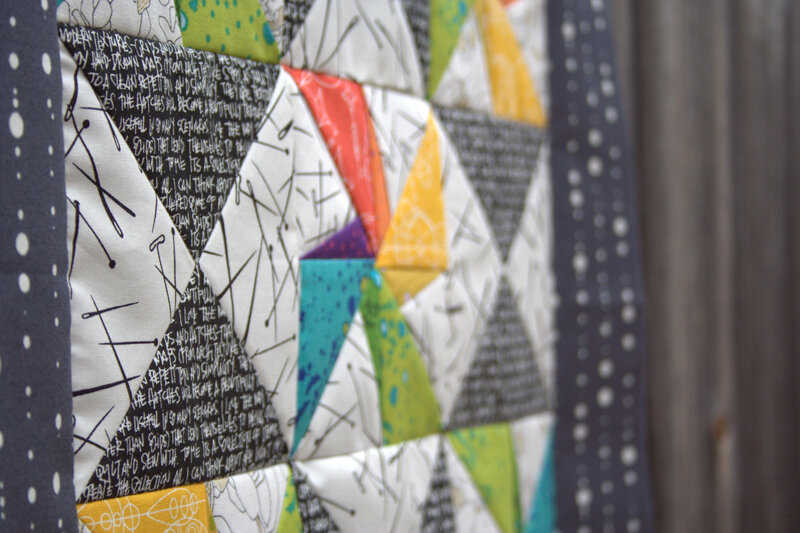 Twice a year, Amy from Amy’s Creative Side hosts a Bloggers Quilt Festival, an online quilt show where peers vote for their favorite quilt in each category. It should come as no surprise that I am entering a quilt into the ROYGBIV category, given my penchant for rainbows. 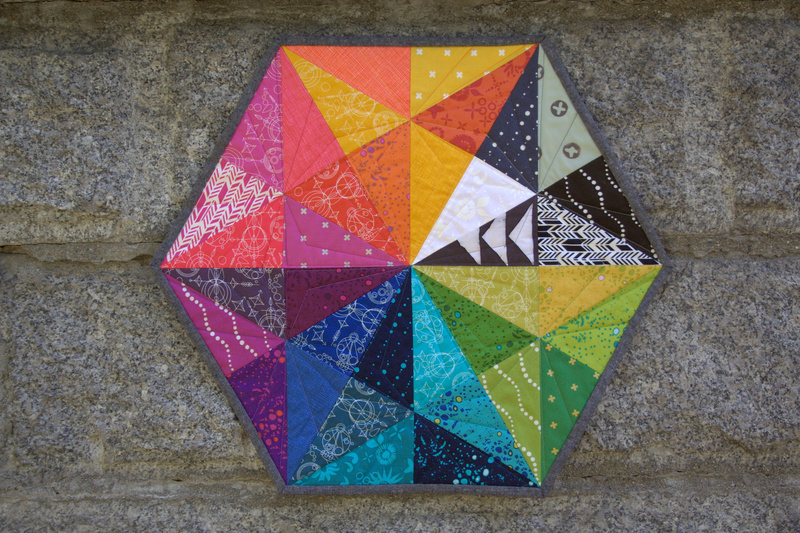 As my first-ever entry into the Bloggers Quilt Festival, I’m entering my Alison Glass Prismatic Medallion mini quilt. 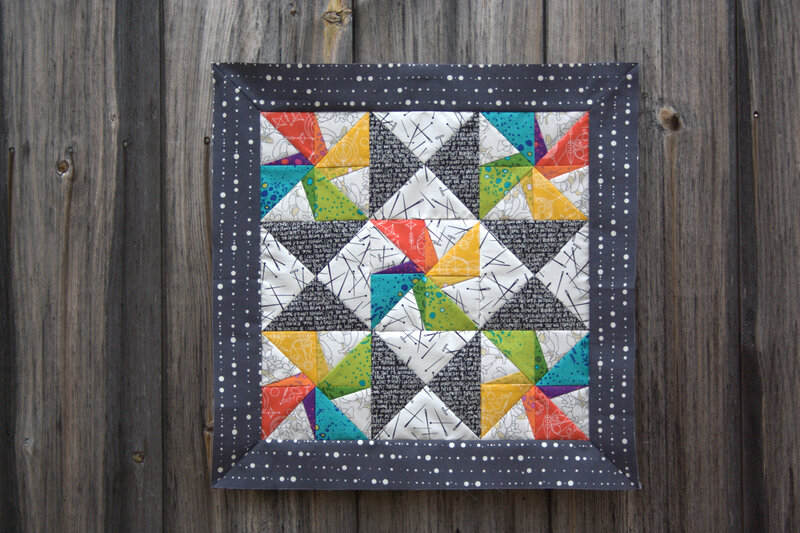 Yes, this quilt will soon be mailed off to my swap partner, but that’s one of the huge benefits of this Quilt Festival–you don’t need the quilt in hand to enter! I finished binding this quilt earlier this week. It’s created with primarily Alison Glass fabrics, most of which come from her newest 2015 Sun Prints Mercury and Grove. The pattern is the Prismatic Medallion pattern offered for free on the Robert Kaufman website. 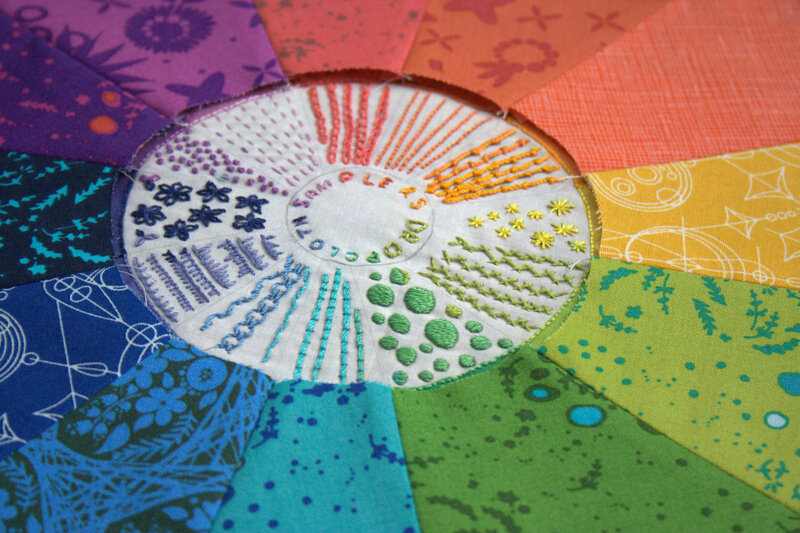 Alison’s Sun Prints offer such a gorgeously saturated and bright color palette, perfect for ROYGBIV quilting creations. I decided to quilt this mini in coordinating Aurifil thread, both 40 and 50wts, depending on what weight I had in my stash. 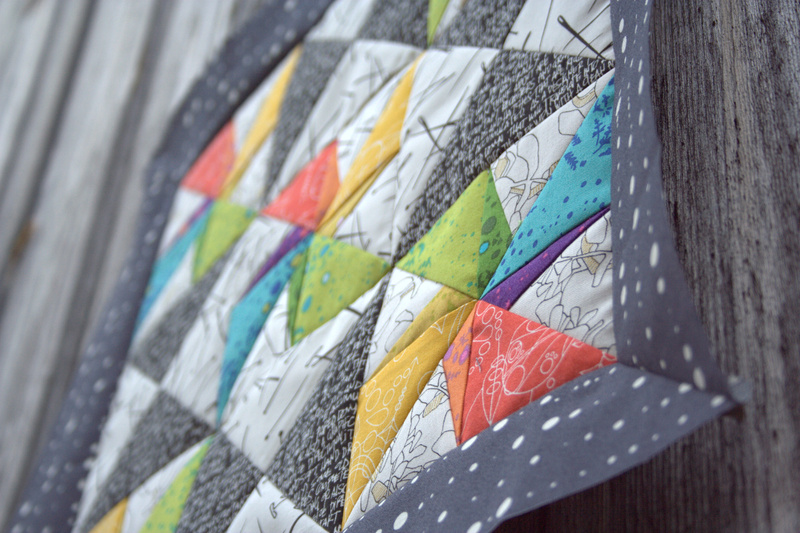 I used a fun prismatic quilting pattern, which really brings out the angularity of the design. Fabric: Assorted fabric from Alison Glass’s 2015 Sun Prints, Mercury and Grove (Andover Fabrics), with other Alison Glass fabrics: Feathers in Dahlia and Black, Bike Path, Handcrafted, and some others, including but not limited to Carolyn Friedlander Architextures Crosshatch in Tangerine, Cotton + Steel basics in yellow, magenta, and green, and some Timeless Treasures Sketch. Binding is Yarn Dyed Essex Linen blend in Charcoal (Robert Kaufman Fabrics). As much of the quilting world prepares for Quilt Market, urgently pushing to complete those finishing touches on booths, accessories, new bags, business cards, etc., I share that energy as I try to get a few last projects from my work in progress pile into the “finished” pile. My deadline is not the impending Market, however. I am entering the final week(s) before having a baby. 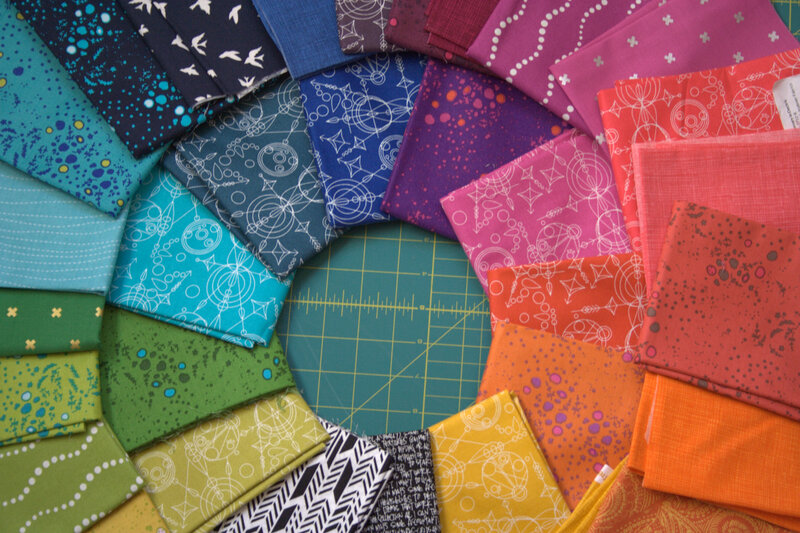 Amazingly, I’m feeling pretty hopeful that I will be able to complete the quilting projects that need to be finished before baby arrives (let’s not even talk about the projects around the house, though–priorities, right? ), and I’m trying hard not to take on more projects in the meantime. Two of the big quilting projects are no strangers to you loyal readers, so prepare yourselves for yet another look at the Pinkalicious Hazel Hedgehog baby quilt I’m working on for my sister-in-law, and the Alison Glass Prismatic Medallion mini quilt I’m finishing up for my partner in the Alison Glass Mini Quilt Swap on Instagram. 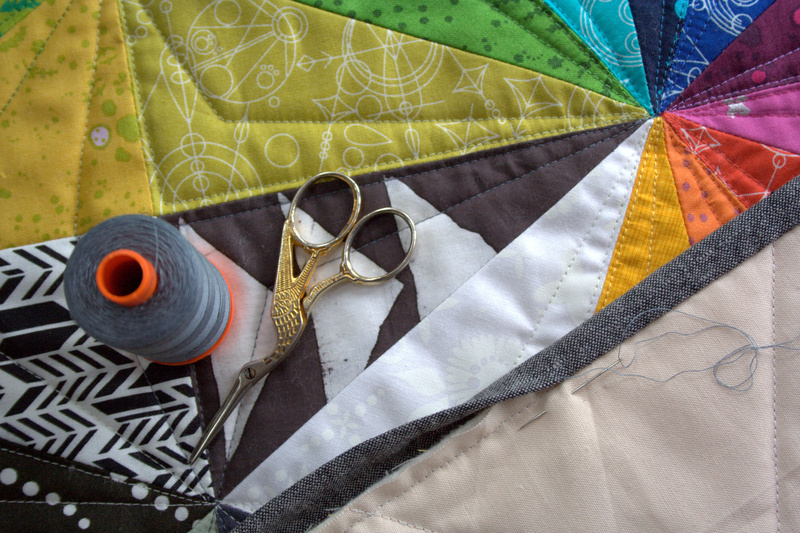 Thankfully, I’m on the final binding phase for the Prismatic Medallion mini quilt. I’m binding it with my new favorite: Robert Kaufman Essex Yarn Dyed Linen blend in Charcoal, with coordinating 50wt Aurifil 1246 – Grey. I used straight-grain binding and next time will use bias binding, since I’m finding that the backs of the corners are a bit off kilter. Since the front corners line up perfectly and look nice and crisp, I’m not worrying about it, but I’m still searching for that secret tip to making perfect corners on the front and back when binding a hexagon. 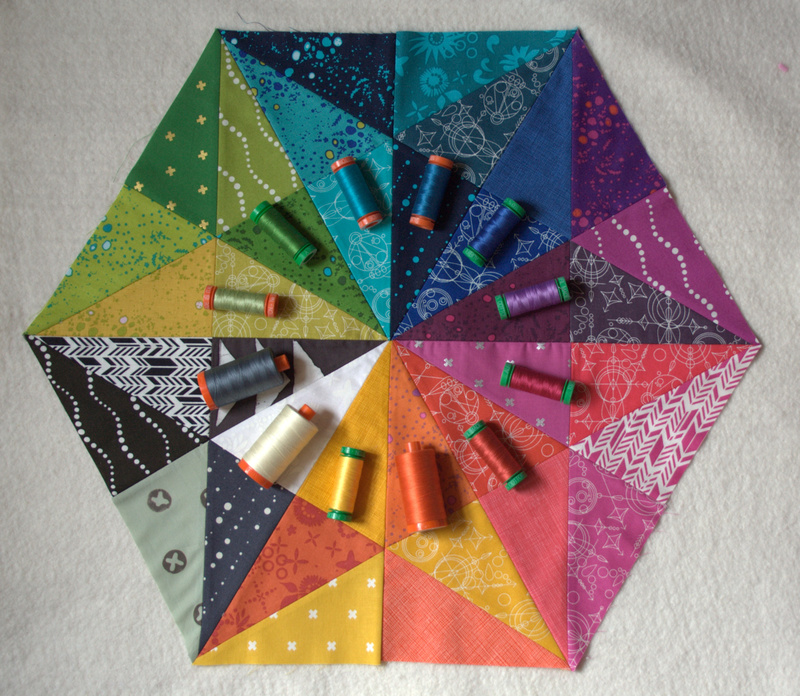 I’m in the process of setting up a skype date with Carla from Granny Maud’s Girl way over in Perth, Australia, since she says she knows the secret to binding hexagons–how awesome is this technological world and the quilting community within it!? I’m hoping to have a mini finish to share soon! I also need to finish quilting Hazel. 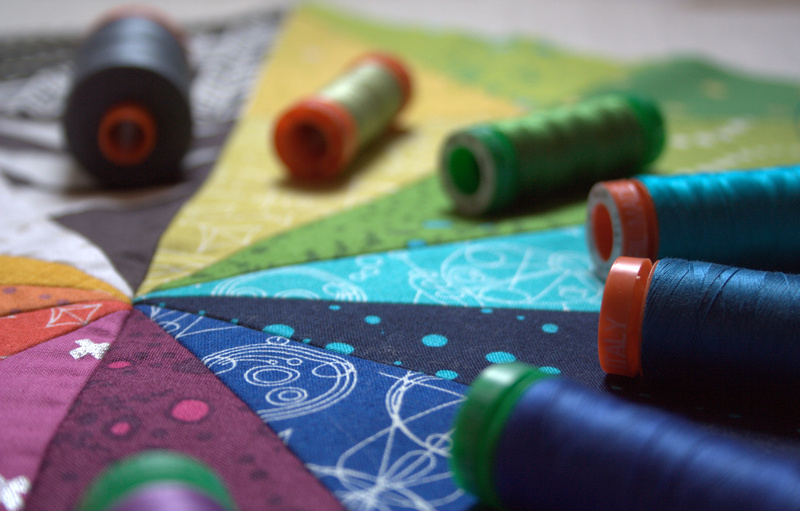 I ordered the coordinating Aurifil from Hawthorne Threads, and now that it’s here, that can go back into my project circulation. I’m planning to do simple outline echo quilting on Hazel’s face and body with Aurifil 2423 – Baby Pink, since it is just a *little* bit pinker than her face and will add the texture without detracting from her features. The lighter pink color will be a fun addition to her bright pink legs and body. 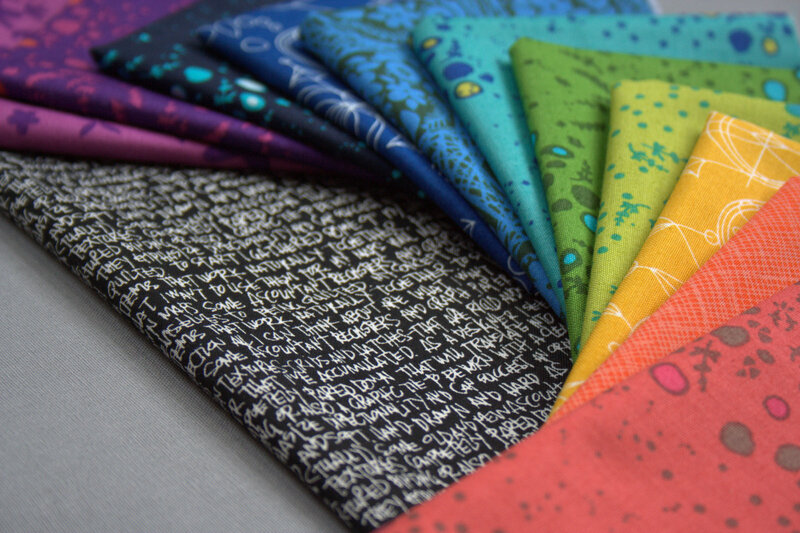 I ordered 40wt this time, since I love the added thickness that helps the quilting pop. I’ve decided to try my very first matchstick quilting in the heart, since it’s a small enough space I don’t think it will be too crazy to complete before baby. Plus, I am going to try to quilt the baby’s name–Reagan–into the heart via negative space. For this, I’m going to use Freezer Paper for the very first time! I bought a big roll over a year ago when my late quilting Grammy said that it was an absolute must for paper piecing. 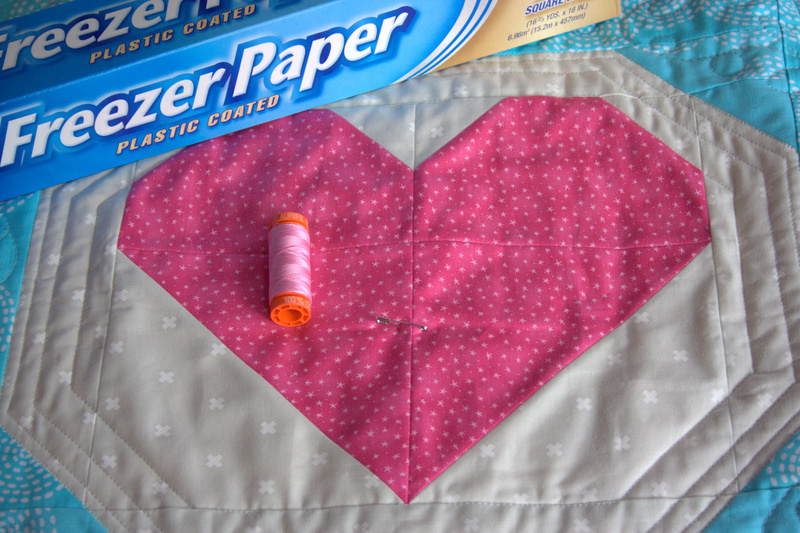 I’ve never used it for paper piecing since I strongly prefer the foundation paper method, but I’m hoping to cut out freezer paper letters spelling Reagan, iron them onto the heart, and then matchstick quilt within the heart, but NOT on the letters. Is that as clear as mud? I promise I’ll take photos of the process, and fingers crossed that it works the way I envision! 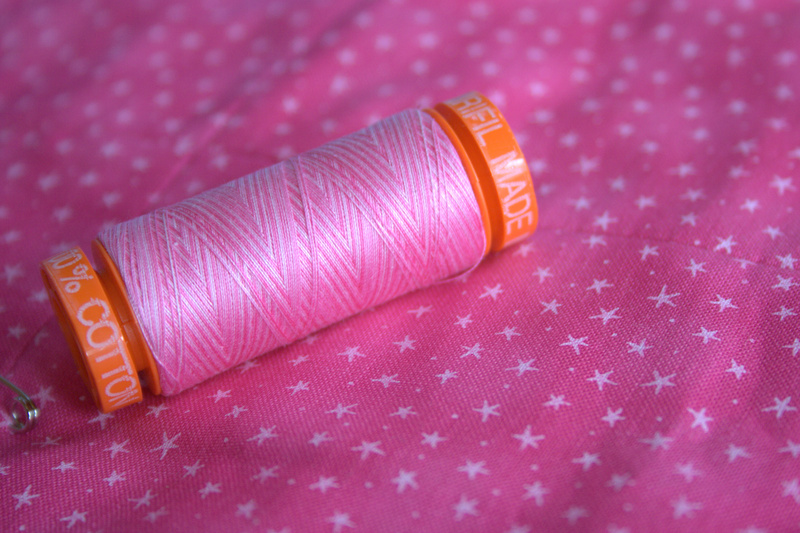 I ordered my very first spool of variegated thread for the heart matchstick quilting, and I think the color is perfect–it’s Bubblegum variegated 3660! I ordered 50wt this time and very well might keep my panacea Dove thread color in the bobbin since with matchstick quilting, I’m afraid of running out of thread before I’m finished. I also have another project, a pattern I’m developing, which I’m trying to finish before baby comes. For now, I can’t show you much, and the progress is not nearly as close to complete as these first two projects. Getting Hazel and the Prismatic Medallion into the finished pile will certainly help me focus on the new pattern, though, so little steps it is! Finally, I thought I’d share my last and greatest work in progress, heading to the “finished” pile at an unknown impending date. 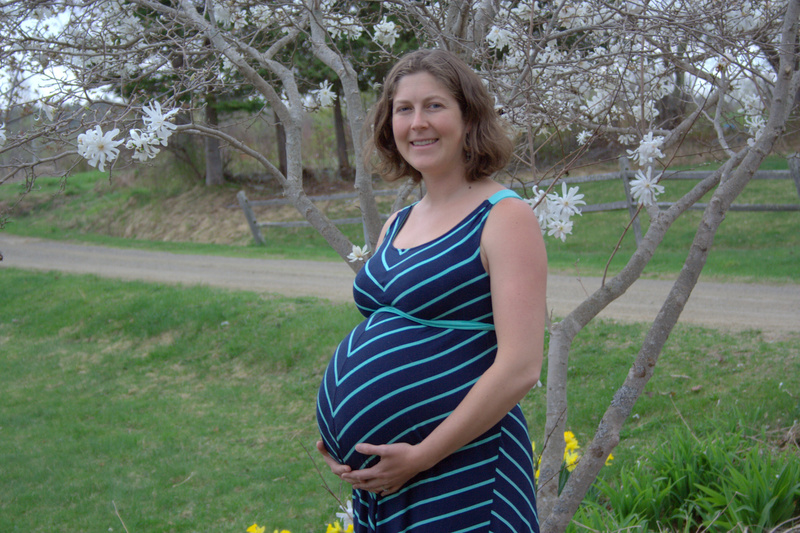 Here I am between 38 and 39 weeks pregnant with my third baby, a boy. He’s still in progress, but should be joining us on the outside world (aka finished cooking) in the coming weeks. Makers gotta make! 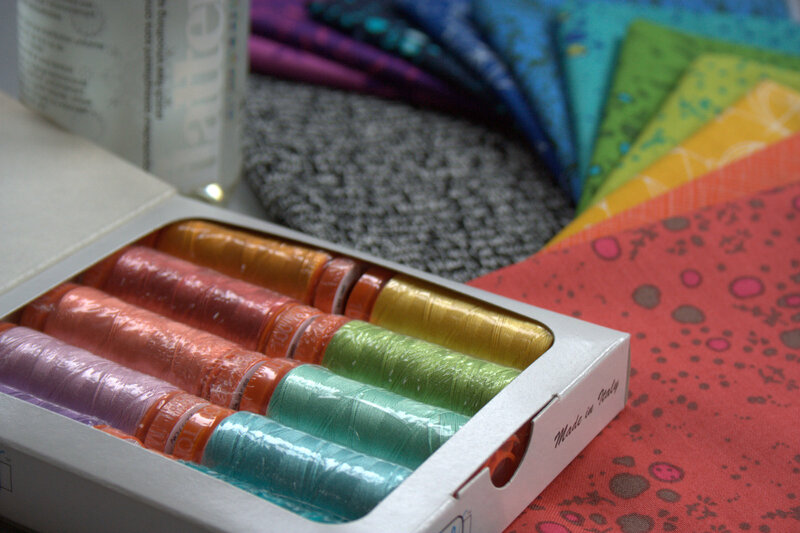 I’m linking up with Freshly Pieced’s Work in Progress Wednesday, and Molli Sparkles’ Sunday Stash, since I added some more Aurifil thread to my stash to finish these projects. 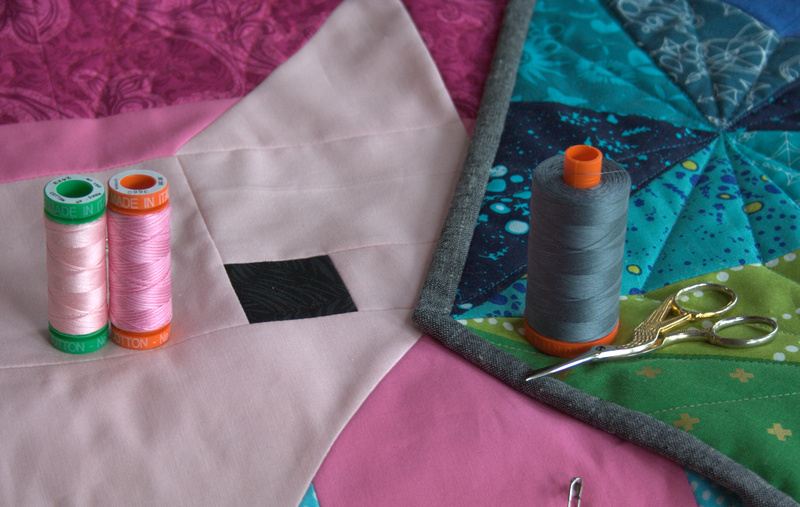 Choosing fabrics for the Prismatic Medallion mini quilt pattern has been hands down the most difficult part of the entire process. As you read in my last progress post for this project, I have been humming and hawing over fabric choice and placement for the last few sections of the quilt for about a month. Finally, this past week, I bit the bullet, made the decision, and finished sewing together the quilt top. Verdict: I LOVE it! I realized that I didn’t take a single photo of the flimsy without the matching Aurifil thread on top, so I apologize! 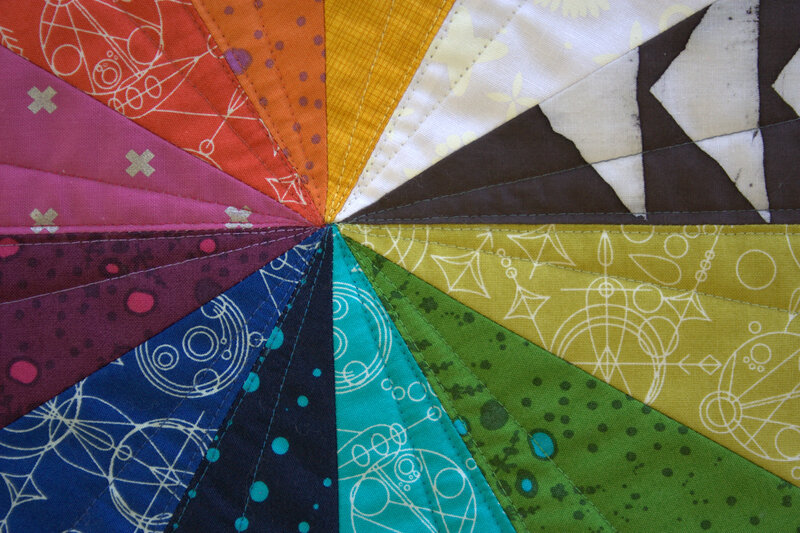 Then again, I don’t really apologize, since how gorgeous is that thread circle paired with the quilt top!? Ultimately, I opted to add some Carolyn Friedlander Architextures Crosshatch in Tangerine to balance out the yellow-orange section, and swapped out some of the more saturated magenta/red Alison Glass Sun Prints for her Feathers in Dahlia, and added in a pinky-orange Sketch section to finalize the magenta-red section. I’m really happy with the outcome. Here they are side by side, with a wide white border so that you can view each individually. Is it just me, or do they look completely different depending on what side you call the top? For this reason, I think I will hold off on attaching a hanging sleeve to this mini before mailing it off to my Alison Glass Mini Quilt Swap partner. That way, while it means they will need to handle hanging “hardware”, they can decide what aesthetic view they prefer. As you can see, I had a lot of fun going through my Aurifil thread stash to find matching thread. My penchant for rainbows paid off, since I had an exact match for most of the colors, and a reasonable match for the remaining one or two. I decided on a prismatic-style quilting pattern, in lieu of the basic “echo quilting the seams” and I’m silly excited about it. I actually finished quilting this yesterday (shhh don’t tell), but haven’t buried any of the threads or tackled binding yet. The full finish will have to wait, but I’m getting close! 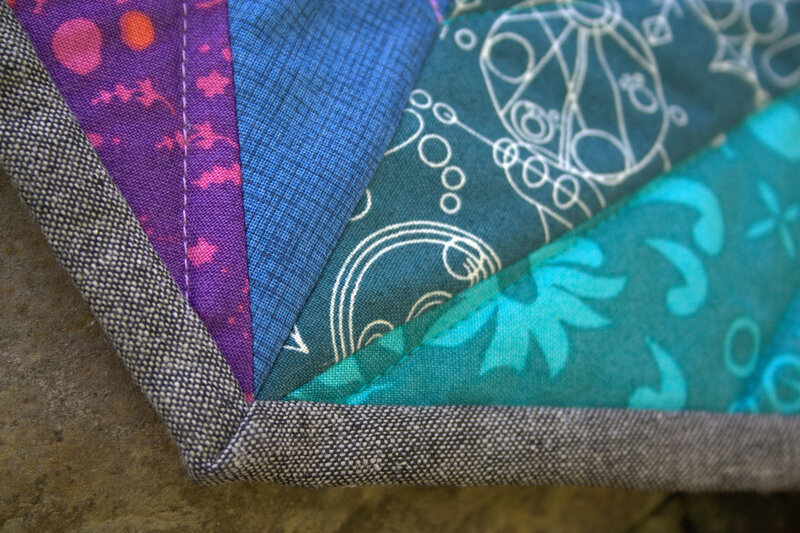 It feels good to have finally made the fabric choice decision and have this mini quilt on the fast track to “finished”. 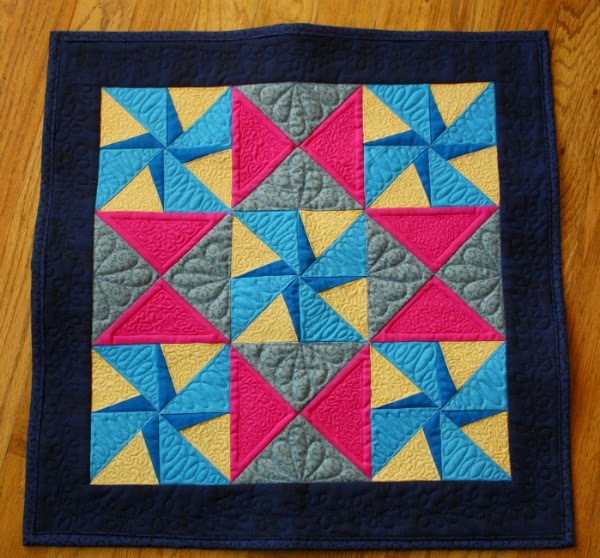 I’m also doubly excited now that I have enough fabric half-rectangle-triangles to make a duplicate of this mini. 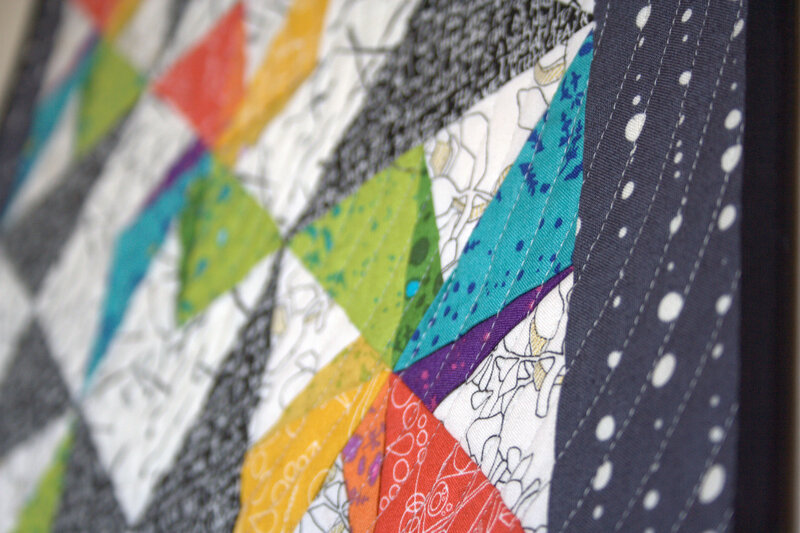 That’s a definite plus to the Prismatic Medallion pattern–two quilts with one cutting bout! I’m linking up with Crazy Mom Quilts Finish it up Friday and TGIFF. Rainbows make me happy. As early as I can remember, I’ve enjoyed arranging things in rainbow order. In high school and college, I would always eat M&Ms in rainbow order. No exceptions. As a mom, putting colored pencils or crayons away in rainbow order fills me with a weird feeling of bliss. 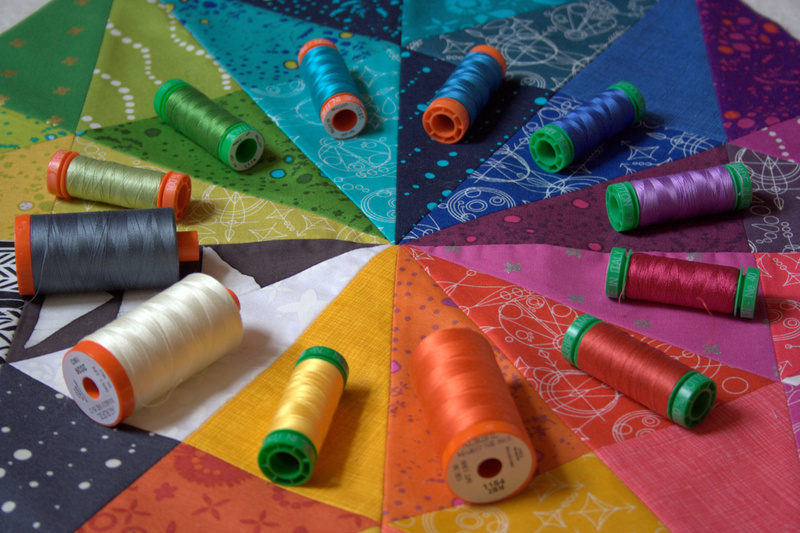 It’s no surprise, then, that rainbow order finds itself into so many of my quilts. For a while, I thought I would “grow out of” my penchant for rainbows. For some reason, in my mind, rainbow order isn’t as mature as, say… marsala, or gold. Then I had a little blog comment conversation via email with Jenn from A Quarter Inch from the Edge, where she pointed out, “Why does one need to get over a penchant for rainbows? We see them so rarely in real life… we’ve got to make a few of our own!” True that! And so, I have embraced my love of rainbows and I’m letting it shine! Here are two of my current works in progress as proof. 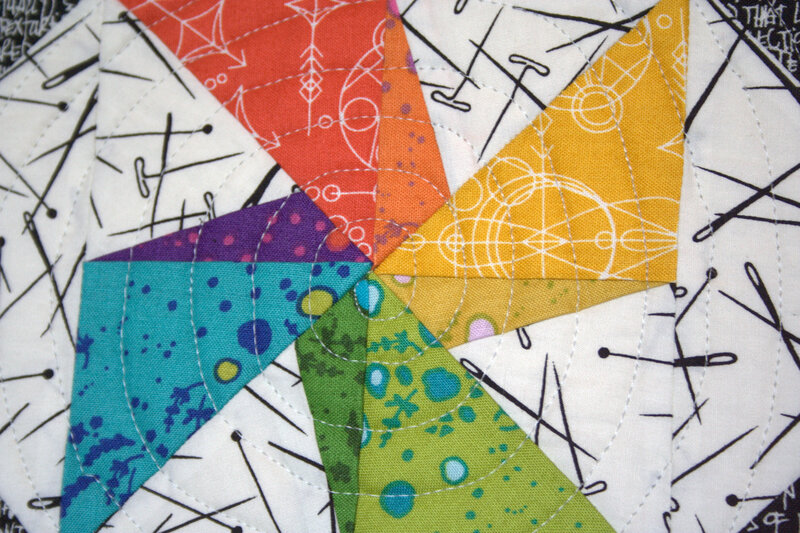 I’m testing a pattern called Twirling Star by Leanne at Devoted Quilter. It has been fun getting feedback on Instagram about fabric choices along the way. 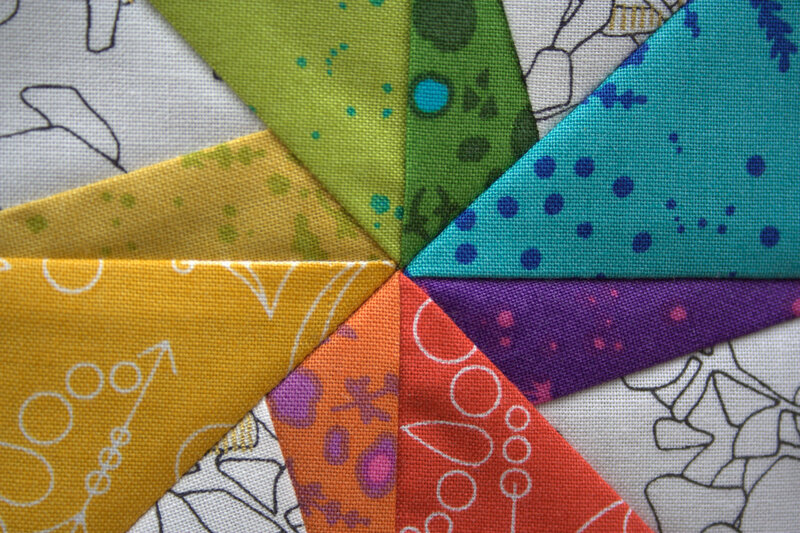 I opted for an entirely low volume background, just switching up the background fabric for the outer pinwheels to help the center star stand out a bit more. Opinions were pretty evenly split between using this Botanics Foliage in Charcoal fabric versus using Ledger from Carolyn Friedlander’s Architextures line. As much as I LOVE Ledger (can you tell I love pretty much all things Carolyn Friedlander? 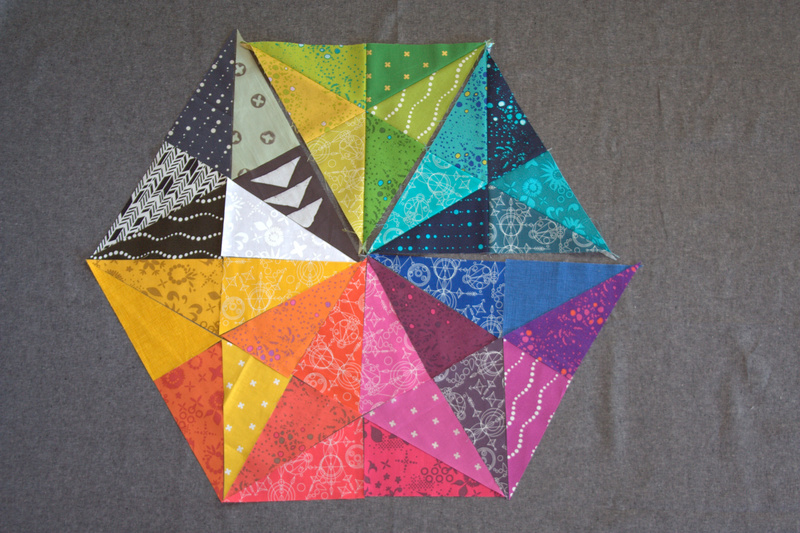 ), I was toying with the idea of spinning the outer rainbow pinwheels, but wanted the flexibility to make the decision after seeing the blocks. With Ledger, the directionality issue would have required that I make the decision before assembling the blocks. Foliage, it was! Now I just need to sew these blocks together and add the borders and this mini quilt top will be finished! Next up is my progress on the Prismatic Medallion mini quilt I’m making for my partner in the Alison Glass Mini Quilt Swap. I definitely attribute my recent burst of rainbow to my purchase of the newest Alison Glass Sunprints. 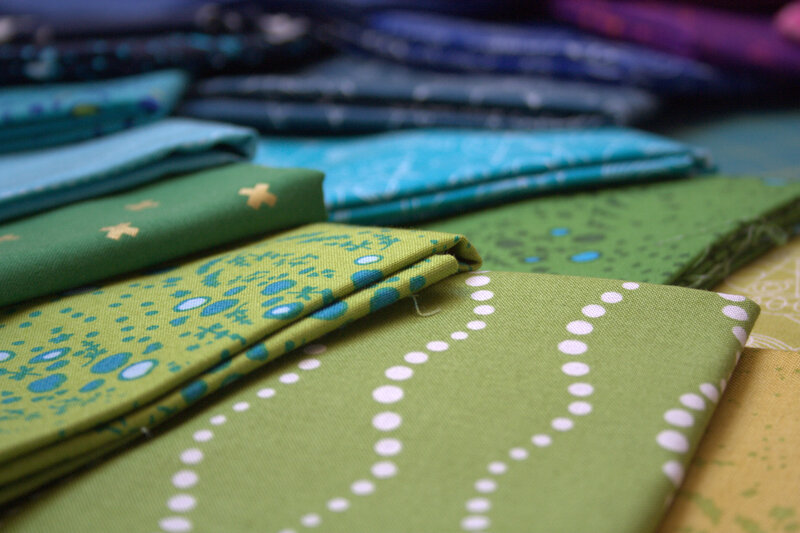 How could you resist making EVERYTHING with these fabulously bright and saturated fabrics!? I’ve finally received all of the supplemental fabrics needed to fill out the black and white section, and all of the pieces are cut. 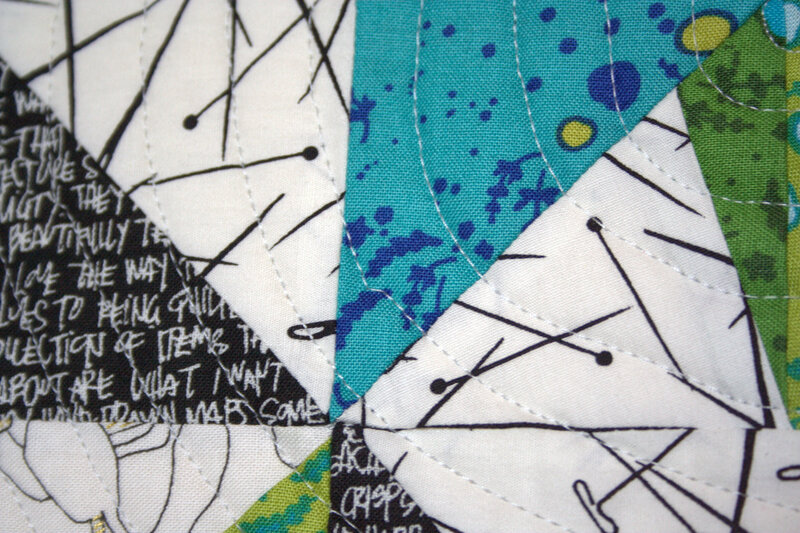 Only the green and blue/turquoise triangles are sewn together so far. I’m really happy with the black and white triangle, and have come to accept the blue/purple triangle. I’m still debating the yellow/orange and the red/orange/magenta sections. Alison Glass handcrafted added in. I think it’s too brown for this palette. 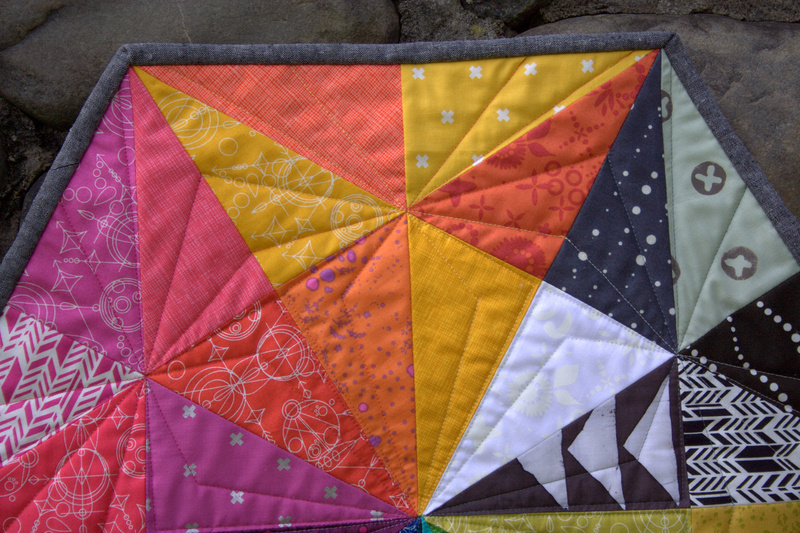 In the yellow/orange triangle (beneath the black and white one), I originally bought a fabric from Alison Glass’ s Handcrafted line to vary the colors a bit. Now I’m thinking it may be too brown for this palette. I’m leaning toward the brighter Cotton & Steel basics yellow instead. Magenta-purple spread out a bit in the bottom triangle. In the red/orange/magenta triangle (bottom center), I’m thinking I will spread out the purply magenta triangles a bit more. I’m thinking this bottom layout will be the final layout, with the C&S yellow and the spread out magenta. I need to decide soon and get this sewn together! What would you do? 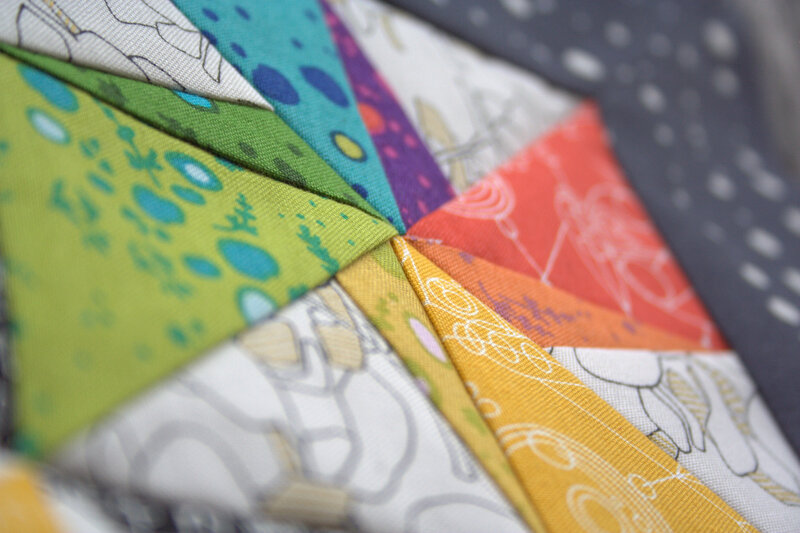 Shortly after finishing the Schnitzel and Boo Mini quilt swap, a flood of other tempting swaps were announced on Instagram. Showing an unprecedented amount of willpower, I only signed up for one: an Alison Glass Mini Quilt Swap. 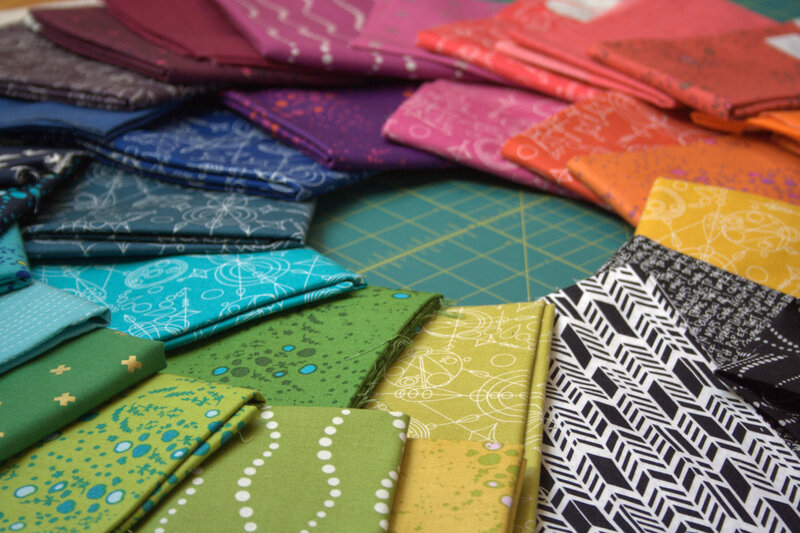 I love the bright saturated colors in Alison’s fabrics, and am really excited about this mini. 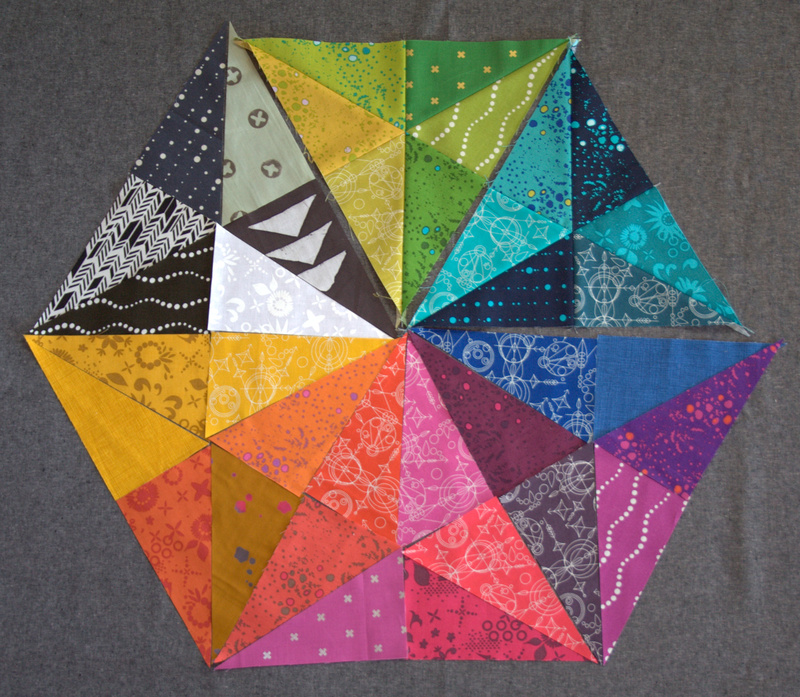 I’ve decided to make the Prismatic Medallions quilt, designed by Susan Kephart for Robert Kaufman. Prismatic Medallion image from Robert Kaufman. 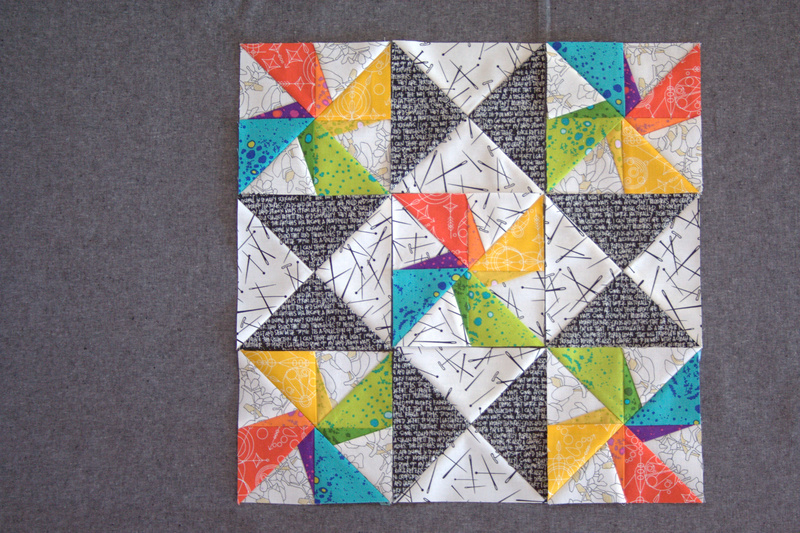 The sample quilt is made with solids, but I think that Alison Glass‘s fabric lines will work wonderfully, too. Check out this gorgeous rainbow! This pull is almost entirely comprised of Alison’s newest Sun Prints, both Grove and Mercury, plus some Bike Path from her older Sun Prints, with some Cotton & Steel basics and Sketch prints thrown in. I have a few little holes to fill, and am aiming to visit my local quilt shop Fiddlehead Artisan Supply sometime this week to remedy that so that I can get started piecing the top. 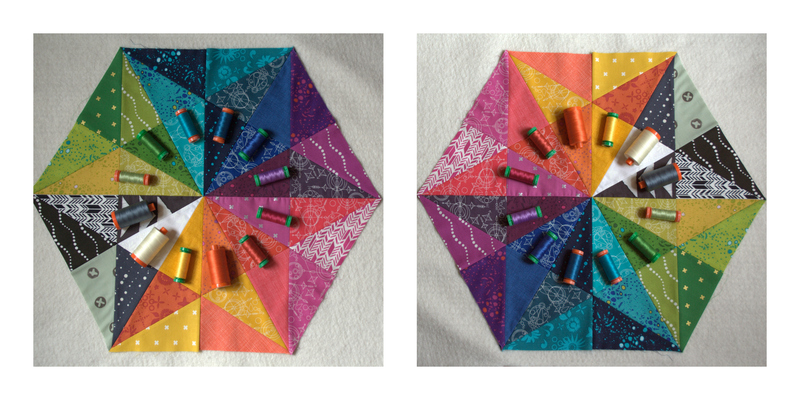 Prismatic Medallions is a free pattern (score!) 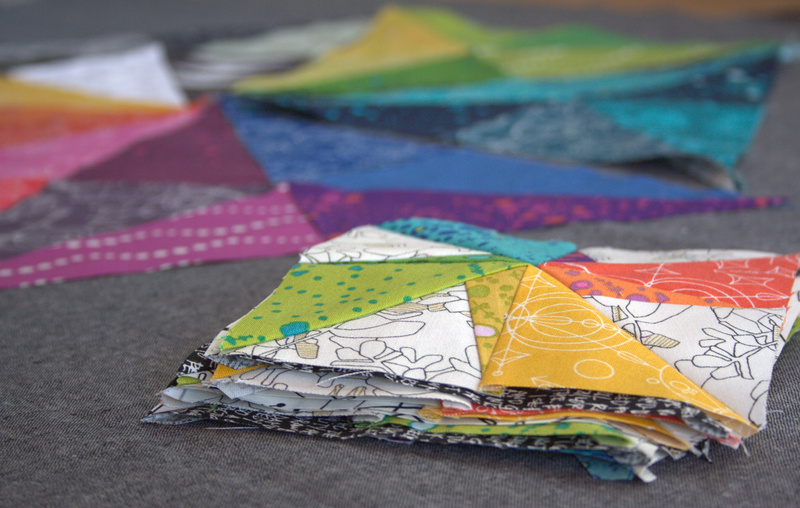 and the cutting directions result in enough triangles to make two quilts (double score!). I guess I’ll just have to make a version for myself, too. Shucks. 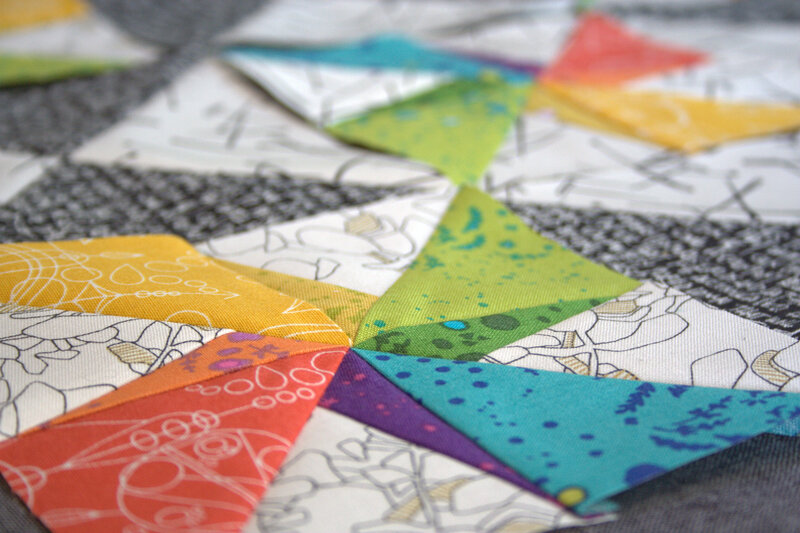 I’m linking up with Freshly Pieced’s Work in Progress Wednesday.